Monroe, Orange, New Jersey, U.S.A. Founded in 1912 by Jay R. Monroe, Monroe is still in business and on its website has an interesting history of the company and its founder, see https://monroe-systems.com/about/ and https://monroe-systems.com/new-page/. See also the article "Notes on Monroe and Marchant Calculators" in the Collecting Calculators section of this site. This is a simple, hand-operated, stepped-gear calculator. This type was first manufactured about 1911 and was developed over the years to this model which dates from the 1960s. Electrically driven models were also made. 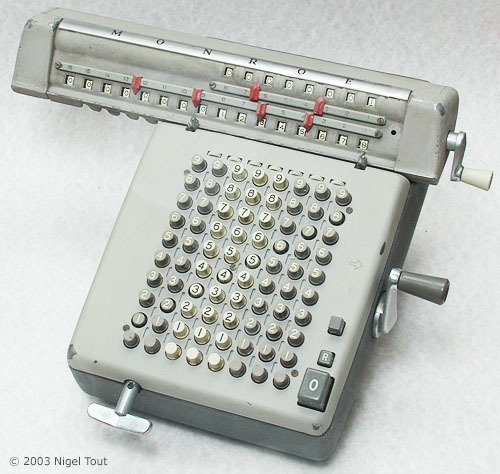 This is a programmable, printing calculator, introduced in 1967. It uses Germanium transistors & delay-line memories. Inside the Monroe Epic 3000 electronics box. Two of the four large circuit boards hinge down this way for servicing, and the other two hinge down the other side. 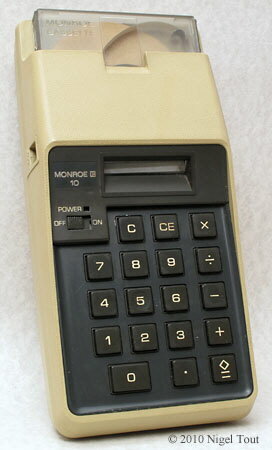 By 1970 Monroe was buying in calculators from Japan badged with its name. The Monroe 10 is a version of the Canon Pocketronic, and prints all output onto thermal paper tape. For further photographs of Monroe hand-held calculators see the Calculator Photo Library on this site.